Since “Digital DC Motor Drive” had been successfully developed in the 80s, it becomes the main variable speed system of machinery and replaces the past way of analog control circuit; the applications are more widespread than before. Digital DC Motor Drive are constantly applied to paper machinery; steel plate machinery for rolling, cutting; drawing machinery of steel, aluminum, copper, stainless; textile fiber machinery; plastic material inflation machine; calender…etc., because the control of digital dc motor drive is accurate and convenient, it is applied to the industry generally. 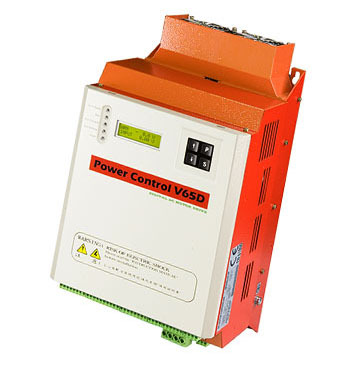 Owing to “Digital DC Motor Drive” uses microcomputer as control center, it makes control’s precision be higher and the application range is much wider than before. The specification and control mode of “Digital DC Motor Drive” could be programmed (In comparison, analog dc drive can't be programmed easily and it is difficultly applied to different brand of dc motors),because Digital DC Motor Drive's control performance is outstanding, more durable, price is competitive, digital dc motor drive are used generally. “ DC Motor Drive ” is used to drive DC Motor, which has the feature of high-torque in low-speed, Euntay Electric Co., Ltd. has been producing DC Motor Drive since from 1988, After a long period of market application and development, accumulated a very valuable experience and technology, set up the foundation for the development of digital DC motor drive. Therefore, after presenting our V65D Digital DC motor Drive, it gradually replaced the traditional Analog type DC Motor Drive in market and becomes the major drive device of machines of large horse power, it is frequently applied to giant metal machining machines; paper machines; wood processing machines; calendering machines; cutting machines; the drawing machines of Aluminum wire, copper wire and stainless wire; textile machines; plastic film blasting machines…etc. To show the movie that “Digital DC Motor Drive” is applied in giant lathe machine, boring machine , wood veneer slicing machine and plastic machine.